the scent of green bananas: the devil wears pirikara. Posted by santos. This entry was posted on 20061005 at 10:50 PM You can skip to the end and leave a response. Gee I dunno, after watching this at a Vivienne Westwood show, I'm kinda sticking to Birkenstocks. and haha about the doc martens. I remember those were a fad in school. I used to get teased about not owning a pair of doc martens when I was in middle school at st anthony. I didn't know what was going on, being straight from the boonies (saipan--close enough). yum...not the shoes but the fish itself....pretty! I wear size 10 1/2 shoes (which are practically non-existent), so I've never allowed myself to get too excited about shoes - those are pretty though. I love your bento though. It looks like a car just drove by, sprayed her legs with mud, and even blew the skirt a little! I was curious to see your inspiration, but I couldn't find it. I looked on the main page and even browsed through several months of the archive - where is it? now, mr. anthony, she's carrying a pail of water--what is that outfit for? mixing concrete for the extension? if you were wearing it, i'm sure you'd be smart enough to wear a longer skirt. shelly--ah, adolescent peer pressure! it's still ruling our lives! sarah, at least the stacked heel is $200 cheaper--you can buy lots of sardines with that. hi cathy, funny, i wear a 10.5 too, but i just get an 11 (frighteningly, the same size paris hilton wears, only like she's a dress size 2. which i am not. ha.) what i especially love about the louboutins is that these seem to start at size 9, to 12! fab. yoo. luss. it's funny, i can't actually find the bento right now--i'm certain it's in the early part of 2006, though. maybe march?? 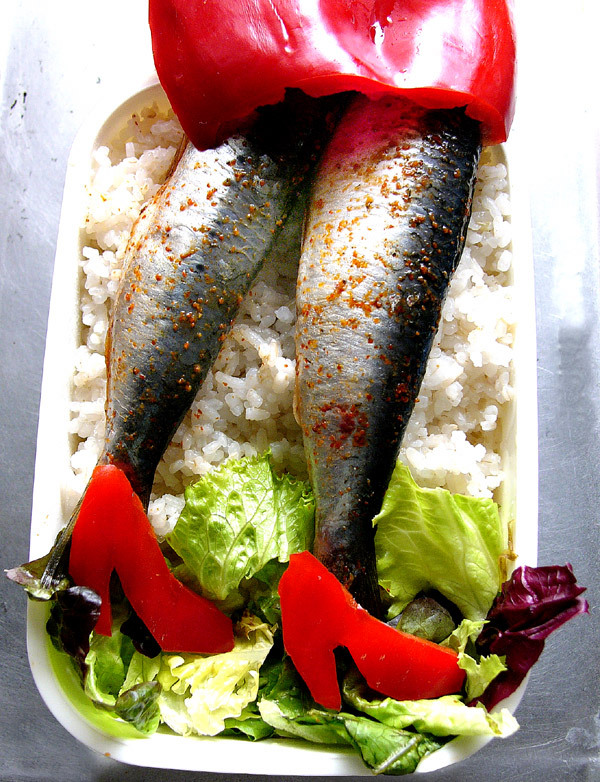 shukumei--i can only dream about the shoes, but i can definitely have the bento! santos - somewhat reassuring to hear that Paris Hilton is a walking stick with giant flipper feet. I'll just revel in my size 6 shoes all day. Those shoes are mindblowing.....$700 is a lot, but hmmmmm..........might be worth it! Your sardine legs look yummy. This is really cute! and thanks for the Cooking Cute link ! Oh, they're beautiful, Santos! Both food and shoes! wow, those shoes are gorgeous! i dont usually wear those platform type shoes but they look soo cute i might even reconsider if not for the price. love the red shoes and skirt on the fish too. Ooooh that's too cute to eat!!! awesome, well dressed and fashionable in a fraction of the price. This is why i love food. hi michelle, lucky you--your feet were made for sample sales! helen, it comes in very handy at sales time, doesn't it? the only time i'm rather happy to have big feet is when i go the high-end shop outlets and find really expensive shoes in size 11 or 12--i've gotten a pair of campers for $10 and some veddy nice gucci sandals for under $20! hello cécile--i hope you find some inspiration there! gitto, they are! but i think i prefer the sardines. pille, what did you think of the movie? toni, no food is too cute to eat! The shoes are cute but I dont' think I'll impoverish myself for them. I like wedges though. So glad to hear of other women with big feet. I've suffered in silence long enough! Anyone know any decent places in Manila that sell leather shoes in size 10/11? hi mila, i've been wondering about that myself--if you find any place with larger sized sandals, let me know too :) i noticed marks+spensive's has larger sized shoes, but not a very good selection. I love the legs! the shades of the sardines are just right.